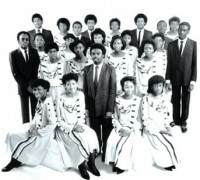 Location: Home › Music Articles › The Inspirational Choir: Britain's much loved gospel ensemble clock up 10 years. The Inspirational Choir: Britain's much loved gospel ensemble clock up 10 years. John Francis of the INSPIRATIONAL CHOIR tells James Attlee what it takes to be still inspirational after all these years. The career of North London's favourite choir has been something of a roller-coaster ride. Catapulted from back-street obscurity into the charts via collaboration with the pop group Madness in the early 1980's, they have long been among Britain's best known gospel performers. Having weathered dealings with two major record companies the choir's mentor, John Francis, has taken the unusual step of deciding to release a self-financed live album on his own label, Opal Records, to be distributed by Travail. I asked John about the choir's years with CBS. "When you join a record company they tend to dictate what you can do. I wanted to do a live album that would represent what we are a bout, without being dictated to. Most of the material they used to let us do were cover versions - things they thought would sell. I t was a good experience because we learnt a lot doing other people's songs, doing different treatments and so on. We did a classical version of "Abide With Me" and it didn't destroy the choir, it helped improve the choir...but in the end it wasn't a great representation of what we were all about. We ran into audience trouble, with people coming expecting strings and orchestra. When we turned up with bass and drums and guitars it was completely opposite. We were in danger of losing our direction-at the same time it helped broaden our outlook." Somehow, The Inspirationals managed to survive the CBS attempt to turn them into black gospel's answer to Mantovani, much as they ha d survived their earlier arrival in the charts on the back of the Madness hit. The story of their sudden rise to prominence has been told before but as this is the first full retrospective of the choir's career Cross Rhythms has carried, I asked John to tell it one more time. "What happened was there was a competition on the programme Black On Black on Channel 4 for the best gospel choir - we entered and w on the competition. One of the prizes was to appear on the show; we sang two numbers and one of the members of Madness saw us. When they heard we were based in Islington (the Nutty Boys were North London lads as well) they asked us to sing on their record. They w anted us to sing on it so badly they gave us a lot of freedom over how to do it. It was brilliant but then again it wasn't, because we got a lot of stick from the church people for working with Madness. Then again it paved the way because we approached Mad ness's record label, Stiff Records, and got a deal ourselves. We also picked up some of Madness's audience so we started to do concerts to people we would never really have reached." Stiff Records' approach was very different to CBS. They, after all, were a label founded on recording originals, the label that brought the world Elvis Costello, The Pogues and Reckless Eric. They didn't try to tone down the choir's gospel roots in any way; indeed they insisted they record under the name The Inspirational Choir of the Firstborn Church of the Living Cod, rather than the shorter but less rootsy and ethnic-sounding Inspirational Choir. Stiff were past masters at marketing unusual acts; sure enough, DJ's stumbled over the name, remarked on it and thus made sure it made the maximum impact on public consciousness. "Stiff Records was different: they allowed us to do whatever we wanted to - we chose some songs and they took it we were going to re cord those. CBS was much more slick, more disciplined," recalled John. Even if the EP the choir subsequently recorded for Stiff in their own right didn't set the world alight sales-wise, it was a useful calling card. TV appearances and an ever increasing range of live appearances followed. Four days after we conducted this interview, John and the choir were due to appear on The Wogan Show. Typically, John failed to mention this and I found out by chance (most pop artists would have been falling over themselves to mention such a prestigious prime-time slot). John appears un-phased by TV; this is probably why he made such a good host for Britain's first home-grown black gospel show, People Get Ready. He told me how he got the job. "I got a phone call from Juliette Fletcher, the girl who went on to co-host the show with me, saying they were looking for a presenter and they had contacted The Voice newspaper who had put forward my name. I didn't believe her really, being that we had grown up together and she always plays little tricks on me! One day, out of the blue, I got a call from Frances Tulloch, the producer of the s how, inviting me out to dinner. She wanted to see my relationship with the choir so she came to rehearsal, which was actually of our United Choir, the choir from all our churches and she decided to use me as one of the presenters of the show." John went on to present two series of the show, incidentally consolidating The Inspirational Choir's position as one of the foremost choirs in Britain. Other projects and the demands of his ministry at his growing church have made him decide not to get involved with the next series, scheduled to start filming in Easter 1992. He does not intend, however, to cut back on the live appearances that have built a name for the choir throughout Europe. They have long since outgrown the traditional black gospel circuit, playing everything from concert halls to colleges, pop festivals to corporate conventions. "We've played quite a lot of places - we've done The Festival Hall, The London Palladium, The Bristol Concert Hall, The Business Design Centre... We played at The Labour Party's Rally, we even played at the Glastonbury Festival; we went down extremely well there. We've been to Holland and France a whole heap of times and just recently we went into the Scandinavian countries - they loved every moment of it, just like the Dutch, the French and the Belgians; they just love the gospel. We hardly do church gigs, we do a whole heap of secular stuff because our agent gets that kind of work for us, but in Scandinavia we've been encroaching on LCGC's territory - it was great to visit the Pentecostal churches out there. We've played nightclubs as well; we've done The Hippodrome, The Limelight and Annabelle's in Berkeley Square" (extremely posh resort of stars and Sun gossip journalists)... "They were all there when we played; Joan Collins was there. I thought, 'I've seen that face before. It was kind of strange really." This must be the understatement of the year - the thought of Britain's most glamorous grannie encountering the down-home testifying of the InspirationaIs is mind-boggling to say the least. But there is stranger to follow. "We played in a conference centre in Monte Carlo for Mattell's Toy Company. That was extremely good, we got very nice treatment; they gave us all free toys and everything. We sing for Ford (motors) nearly every year, whenever they have a ball or a presentation or anything - we've just done their Christmas 'do' at the Intercontinental Hotel." All this seems a long way from John and the choir's roots in the Firstborn Church of the Living God in Islington. In New York in the early 1960's there was a nightclub called The Sweet Chariot where trendy night birds went to sample the gospel experience. Waitresses wore thigh length choir robes, the toilets were labelled Brothers and Sisters and the music on offer quickly degenerated to the level of cabaret pastiche. I asked John if it was possible to play the kind of venues the choir has been doing without swapping the message and integrity of the music for mere entertainment. "My policy is, to get people's attention you have to be entertaining - let the music speak for itself, but at the same time I'm me. There are certain places you go you know you can't do certain things, then you have to let the music speak for you and bring over your message, because we still believe in bringing forth a message. When I've got time I'll even preach and they won't even know I'm preaching, I do it in such a musical way. We do a lot of colleges and universities alongside pop artistes, this kind of thing the Lord has blessed us with. We'll go in and they have the biggest names but for some reason we'll be headlining the whole thing and after we finish they'll turn round and say they couldn't believe we were so good. We get referred from one university and polytechnic to the next; that's how we made our name, on that circuit. Every college wrote letters to the next saying, 'You ought to book this choir'. We've done the Oxford and Cambridge balls, we've played Oxford so many times. We've just finished a string of college dates and even today I got a letter from a student at Warwick University saying how brilliant they thought it was." John's commitment to taking gospel music to unexpected quarters isn't limited to the concert platform. He regularly gives workshops in gospel singing, to people from all kinds of backgrounds. Back in 1990 I spoke to him after he had just given a week-long workshop in Cardiff. Singers had come from all over Europe to attend classes in styles of singing including African, Bulgarian and Opera. The buzz, however, was about the gospel class. John didn't preach at his pupils. "I didn't start with prayer, I let the very songs I taught begin to speak to them which they did, strongly, because they started asking about Pentecostal churches in their area. I know without a doubt that they were touched - they were crying. They were all trained singers in Opera or whatever. What I had to do was to bring the gospel out of them. I told them, 'All that you've been taught over the years you're going to have to throw out of the window now.' It was great, their singing was excellent, I wish you could hear the tape of the performance, you would not believe it. I'm not talking about black people at all - for some reason they always think t hat to sing the way we do you have to be black, which is rubbish. There's a lot of black people that can't sing at all, but if you've been taught to bring it out you can bring it out." John's commitment to teaching and developing gospel music in Britain has led to the seeds of a new project in 1992. "I'm planning a Gospel Music Convention, interdenominational and the first of its kind in this country, with teaching clinics and workshops in the day and church in the evening with a mass choir. We're looking at venues at the moment, we need one main hall and lot s of small rooms for the different clinics. Basil Meade (of LCGC) will be involved; I've spoken to a lot of people who are very excited about it." The near two years since the recording of the live album have been frustrating for The Inspirationals while John and others have tried to sort out distribution arrangements. It now goes out through Travail in this country, who are gradually making more and more in roads into the mainstream shops, but John is still seeking to tie down an American deal. He's clearly pleased that here at last is an album that approaches what The Inspirational Choir are all about. "It's us. The good thing about it is that it's not a burden to perform songs on this album, whereas before it used to be! We enjoy performing these songs, fifty or a hundred times. I want to have input into what I'm doing, not let other people decide what I'm going to record. A lot of people in gospel today are losing direction, just looking for a hit record and forgetting the message!" This is not something John is likely to do. He and the choir have arguably done more than anyone else in Britain to bring gospel to a wider audience. After all the ups and downs and sheer hard work of their career, that vital 10 per cent that's needed for gospel genius is still there. They're still Inspirational after all these years. The Wings of Faith they performed at the Royal Albert Hall - 1984.